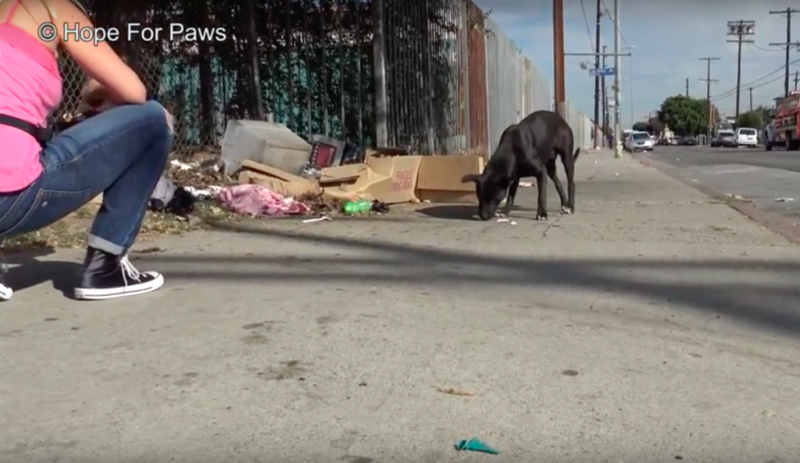 Hope For Paws received a call about a dog who was searching for food in a pile of trash. Roaming the streets as a stray, garbage was all he had to eat. Hope For Paws volunteers Lisa Arturo and JoAnn Wiltz drove to the area to find this poor homeless pup. Once they spotted him on the sidewalk near the pile of trash, they held out food to him but he was very reluctant to get close enough to them to take it because he was so nervous. They knew he was starving so they left food and water on the ground and waited for him to get comfortable with them being nearby. He started eating the food, and then they put some more on the ground near the bowl. When he went to go eat it, they were able to quickly get the snare around him. The dog was terrified and freaked out. He tried to get away but he was already in the snare. At one point, he even tried to chew his way out of the snare, so they knew they had to act quickly. 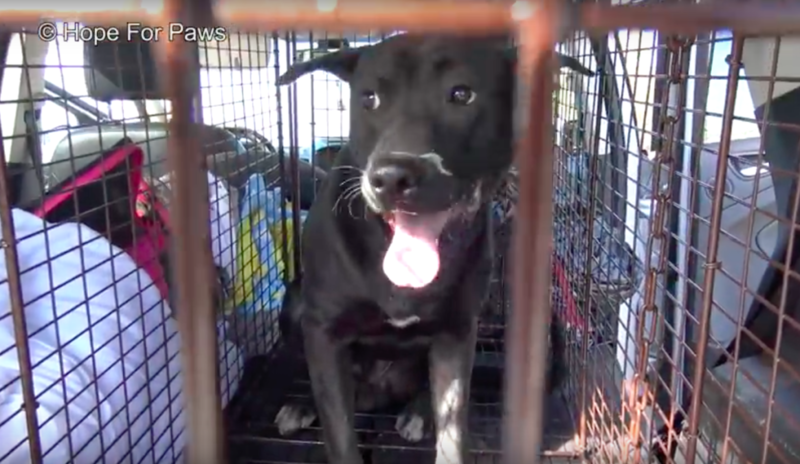 With help from Good Samaritans, they were able to get the dog into a crate and then took the snare off of him. They lifted the crate into their car and took him back to their clinic. 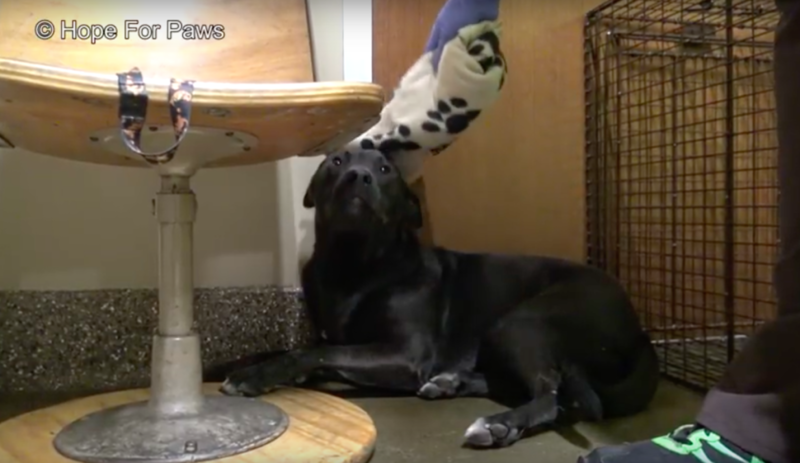 The pup, who they decided to name Jet, was still very scared of people. It was obvious that he had little to no human interaction during his life. He didn’t want to be near anyone, and would hide the best he could from them. They used a towel to pet him to try and gain his trust. But their interaction with him wouldn’t be enough. They decided that it would be a good idea to send him for training and rehabilitation at Sunny Day Acres. Their idea turned out to be a great one! A few weeks later, Jet was already acting like a whole new dog. Once he felt safe and gained people’s trust again, he began to break out of his shell. 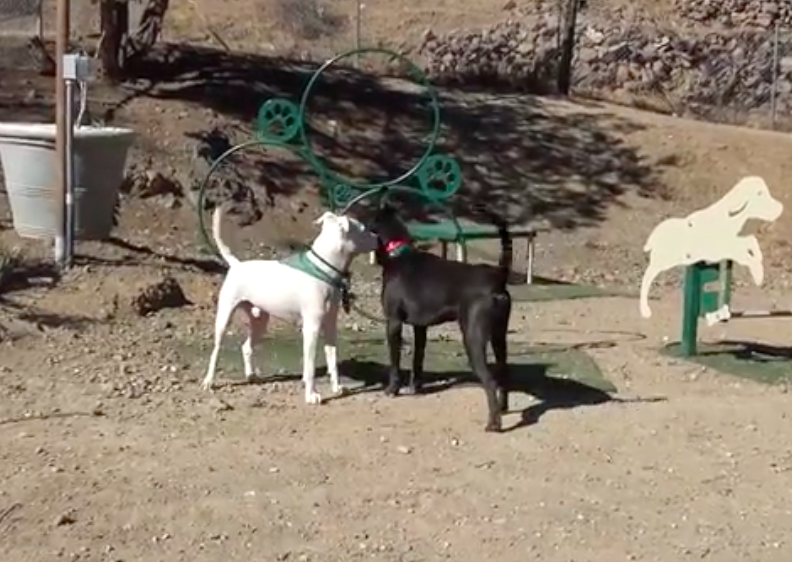 He is a very friendly pup who is now so outgoing and loves playing with his new doggy friends. He even found a forever home!